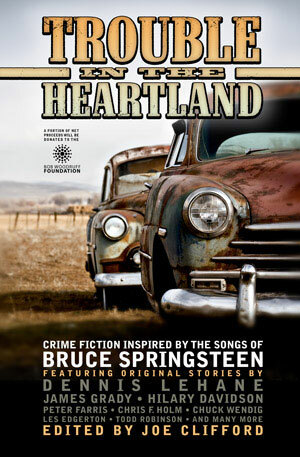 Trouble in the Heartland: Crime Fiction Inspired By the Songs of Bruce Springsteen. Edited by Joe Clifford, featuring stories by Dennis Lehane, James Grady, Hilary Davidson, and more. Bruce Springsteen's music has inspired many writers to find their own darkness on the edge of town. This anthology collects more than 40 tales of desperate hopes, unfulfilled dreams, lost loves, and hungry hearts: each of the crime fiction writers from around the world collected here chose a Springsteen title as a starting point and drove headlong to wherever that inspiration called. The destinations are as wildly diverse and far-reaching as the songs that influenced them. Some arrive at hope and redemption; others end up smoking in a ditch. A portion of net proceeds of this project benefit the Bob Woodruff Foundation. Gutter Books/Zelmer Pulp, softcover, 254 pp. Ezra Letra - Does This Bus Stop at 82nd Street?